Malala Yousafzai has been rocketed to fame by her brave fight for women’s education in Pakistan, where the literacy rate (especially for women) is consistently dropping. Most known for being shot in the head by the Taliban, Malala describes her journey from going to school in her small village to writing a blog about Taliban control in Pakistan to standing up internationally for women’s rights. Together with descriptions of her activism for women’s rights, Malala depicts the lush beauty of her native land with such vivid pictures that we can’t help but long for it ourselves. She has such a strong connection to both the valley and its people that the possibility of further Taliban attacks doesn’t stop her from wanting to return. Throughout her narration Malala weaves Pakistan’s turbulent history with her own family’s memoirs. Through her eyes we are able to see the serenity of her valley succumb to the fundamentalism of the Taliban and its struggle to get out. Malala’s love for Pakistan and her passion for the rights of women is contagious and in 2013, she was nominated for a Nobel Peace Prize. While she didn’t win, her dedication to the progression of rights for women is an inspiration to us all. It is youth like Malala that will bring positive change on a global scale in the future. 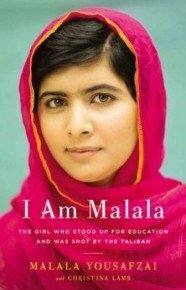 If you’re interest in prominent Pakistani women, check out I am Malala or one of our items about Benazir Bhutto. Happy Women’s Rights and International Peace Day all!